”Snowflakes” was a kit I purchased at a store or through a catalog – not sure which – but it is copyrighted. So, I can’t copy anything for anyone. I don’t know how to contact the designer (Marjorie Gosz) or if the company (Spinnerin Yarn Co., Inc.) still exists. The design was stamped or printed on 50% rayon /50% polyester fabric. The trees were made using white 100% rayon textured yarn worked in a straight stitch of various lengths. It required a large needle (~3” long with a huge eye – not sure of the size #) & gentle pulling through the fabric. 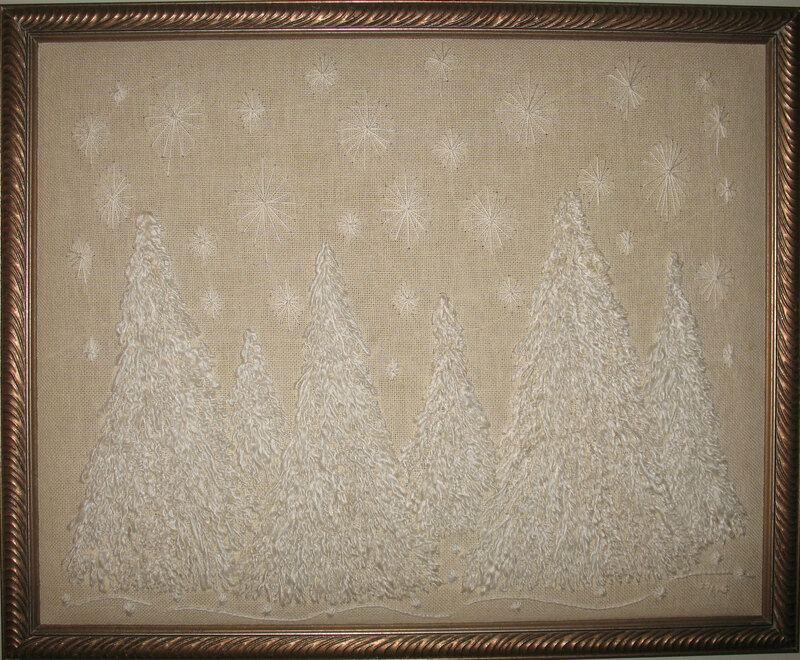 The snowflakes used white cotton floss also worked in a straight stitch of various lengths. Along the bottom are a few stem stitches. I used all 6 strands of the floss that I didn’t separate before using b/c I hadn’t heard about separating threads & the kit didn’t say to do that – so I didn’t. In honor of this snowfall, I’m posting ‘Snowflakes’, a piece designed by Marjorie Gosz. It was a kit from Spinnerin Yarn Co., Inc. I completed it years ago and gave it to a dear a friend, Dottie, who lives in the Poconos now. Ironically, we’ll get more snowflakes here in Philly than she’ll get! It’s really coming down. I am pleased to find that I had saved the directions that came with the kit. If I ever reorganize, I probably wouldn’t be able to find anything in my piles. I wonder what else I saved? And, as much fun as it is going through all this, it’s a better snowbound weekend to stay inside, keeping warm, being safe, and stitching!